This unusual and fantastical beast was discovered in Lismore, Co. Waterford during the 19th century. 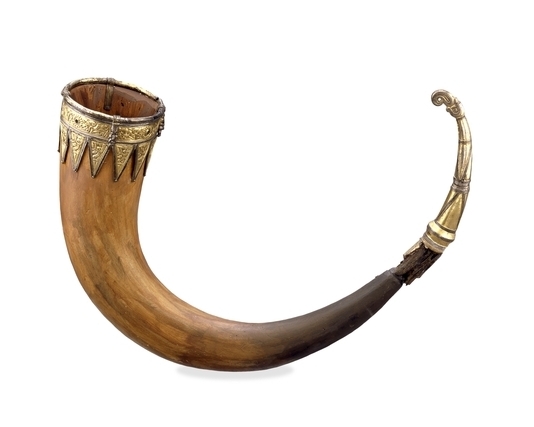 Fashioned out of bronze, it originally adorned the pointed end of a great drinking-horn. It probably dates from the 7th or 8th centuries AD and appears to depict a stylised bird. The mount measures approximately 9 cm in length and was attached to the drinking-horn via two rivet holes in the rim. The long ‘beak’ originally contained a set of teeth along its length, while the cheeks are decorated with a pair of spirals. Another spiral adorns the end of the beak and is suggestive of a tongue. Unfortunately the organic horn, to which the mount was attached, no longer survives. These distinctive bird-head drinking-horn terminals are well known from Anglo-Saxon contexts in England. For example, the end of the magnificent Taplow horn is also decorated with a stylised bird-head mount (illustrated above). 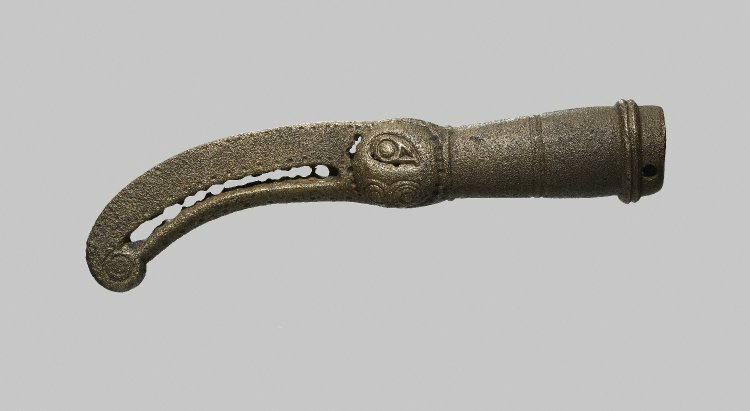 Similarly, the famous Anglo-Saxon royal burial at Sutton Hoo contained a pair of drinking-horns which were adorned with comparable bird-head terminals. In Ireland these type of mounts are rarer, but have been recorded a sites such as Carrig Aille, Co. Limerick and Ballinderry, Co. Westmeath (MacDermott 1950, 262). 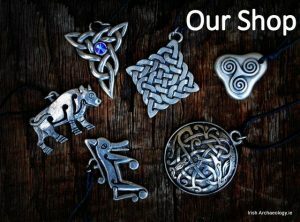 Today the most famous surviving example of an Irish drinking horn is the Kavanagh Charter Horn. This ceremonial drinking vessel was associated with the Caomhnách kings of Leinster and probably dates from the 12th century (although modified in the 15th century). 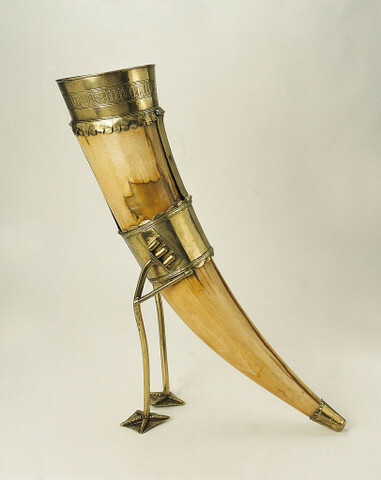 Indeed, it appears that elaborate drinking horns may have formed an important part of Irish royal regalia. 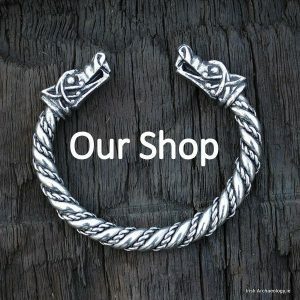 They are mentioned a number of times in Irish chronicles, for example in in 1151 Toirdealbach Ua Conchobair (Turlough O’Connor), king of Connacht presented the drinking horn of Brian Boruma to the nobles of Síl Muiredaig and Conmaicne. Similarly on his death in 1156, Toirdelbach left his his own personal drinking horn to the church (after FitzPatrick 2004, 9-10). It seems likely then, that the Lismore bird-head terminal adorned an elaborate drinking-horn, whose owner was a person of considerable standing. If they were a member of the local nobility, however, remains unknown. FitzPatrick, E. 2004. 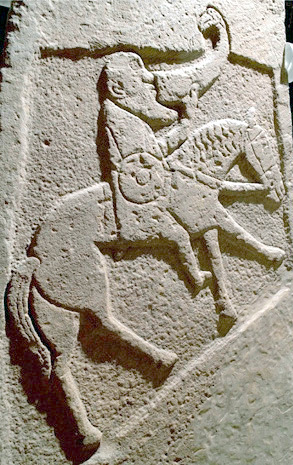 Royal Inauguration in Gaelic Ireland c. 1100-16000: A cultural Landscape Study. The Boydell Press, Suffolk.